Will you help us celebrate seniors week in August 2017? Queensland Seniors Week 19-27 August 2017, provides the opportunity for older Queenslanders to explore programs and services, events and activities, connect with people of all ages and backgrounds, to celebrate the many contributions older people make in their communities. Council on the Ageing (COTA) Queensland coordinates Seniors Week on behalf of the Queensland Government. Both COTA Queensland and the State Government value the contribution older people have made – whether as volunteers or in the workforce, community carers or leaders, grandparents or advocates. Last year, our Jubilee Wanderers decided to flash mob Brisbane CBD’s Queen Street Mall to celebrate with a routine choreographed by Busy Beats Fitness and Dance’s Alyssa Beasley. To Madonna’s Vogue and many other hits including Gangnam Style, the dancers rocked through this unique performance in the middle of the mall. 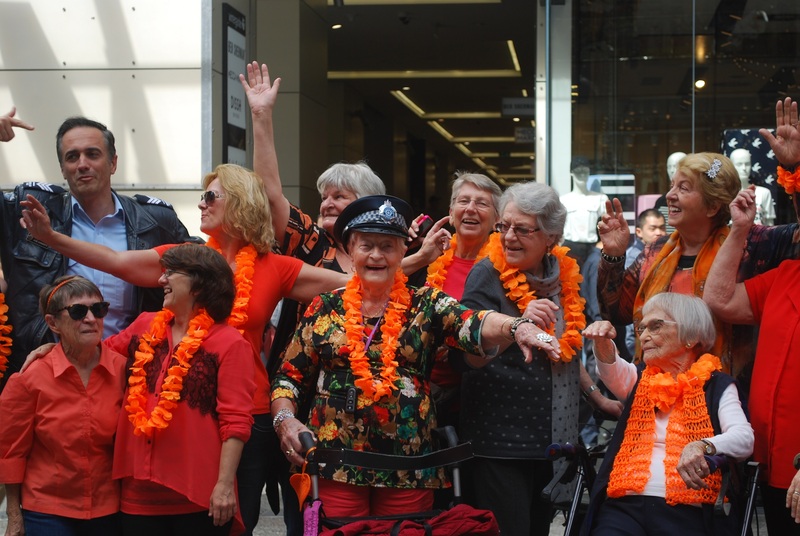 Dancers of all ages joined our Wanderers who proudly danced their hearts out with orange props, wheelie walkers and walking sticks. The audience that gathered were brought to tears of joy as they watched these seniors dancing with a very special freestyle by Sergeant Sarmiento from Queensland Police Service’s Indooroopilly Beat. Through media across Brisbane, they raised awareness with an audience of 3.5 million! Will you join us this year? Get involved this year by calling Vicki on 07 3871 3220. We are inviting our whole community to join us.